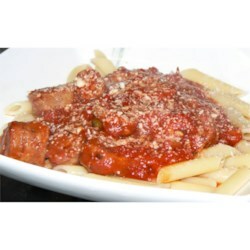 "If you like sausage, you'll love this thick, meaty sauce! Try sweet Italian sausage for a less spicy version." I followed this recipe exactly, and my husband said it was the best sauce he'd ever had. Thanks sooooooooo much! I love to see that gleam in his eye. Great stuff. Kids loved it. Holy Cow! I loved this!!! Flavors turned out sooo good! Next time will triple the recipe and freeze it! Great over any pasta... sooo much better than store bought!